Join Dive The Big 5 on a unique dive in the magical kelp forests of the Cape Peninsula in search of Broadnose Sevengill Sharks (Notorynchus cepedianus; Cow sharks). False Bay is one of the only places in the world that you can consistently dive with over 10 and up to 70 of these ancient looking sharks. 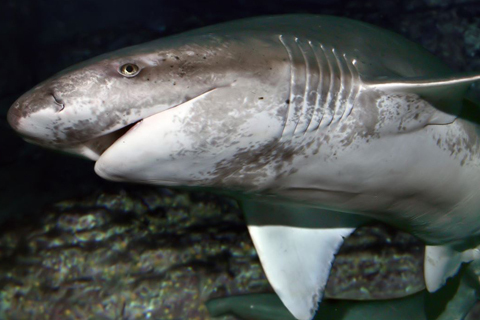 Sevengill Sharks are formidable predators of Cape Fur Seals, other species of shark and fish. They can reach lengths of 3m and wight up to 700 pounds. What adds to the unique experience is that because of their natural curiosity and confidence we don’t use any form of chum or bait to interact with them. 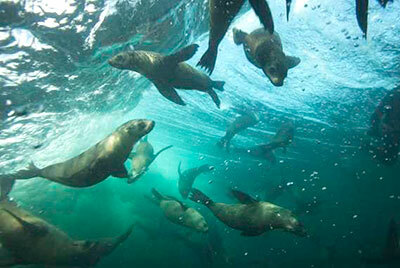 Then for a second dive we will introduce you to the best dive buddies you will ever have, the Cape Fur Seal. Dive with up to 40 of these energetic characters at a time. The fur Seals are masters of the underwater world and they will amaze you with their acrobatics. Question is: who is playing with who on this dive? • Meeting time depends on the weather but it should be more or less anytime between 9am and 11am. • On arrival at the dive shop we will dispense with the formalities of signing indemnities, kitting up and the pre-dive planning. • You will board the boat after all the above is done, the dive site is about a 20minute boat ride from Simon’s town pier. • Between dives we will have a lunch and snack break, before being briefed for the second tank dive with the Cape Fur Seals. • The 2 tank dive trip will be around about 3-4hours, depending on the weather and animals.